Why are Emotional Neglect and depression often experienced together? 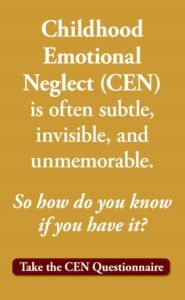 Let’s start with a brief refresher on Childhood Emotional Neglect (CEN), how it happens, and how it plays out through the neglected child’s adult life. Childhood Emotional Neglect happens when your parents fail to respond enough to your emotions as they raise you. Your emotions are not important, not relevant, or not welcome here in your childhood home. Children who receive this message often as their brains are developing naturally adapt to their situation. They automatically wall off their feelings so that they will not be a burden to their parents in their childhood home. This naturally adaptive step is truly an amazing solution. But, sadly, it backfires in many ways as the child grows into adulthood. One of those ways is by making you more vulnerable to depression. You’ve walled off your pain and it now weighs you down. When you were a child, you learned to push all of your feelings away. This became your primary way of dealing with difficult emotions. When your feelings were hurt, instead of using this as an important message from your body, you tended to push it away. Throughout the decades of your life, this is how you have managed most of your sadness, loss, anger and other pain. But, unfortunately, blocked off feelings never really go away. They collect, all swirled together, on the other side of your wall. Since you’re unaware of them you can’t process them. They may arise at times when you least expect them, and they also weigh you down, sapping your energy and making your world feel heavy or gray. They make you more vulnerable to depression. Your joy is blocked off, along with all your other emotions. Blocking off feelings is usually not possible to do in a discriminating way. Unfortunately, you cannot choose to wall off some emotions and not others. So when you block of negative emotions you also lose your positive ones. You may find it difficult to experience happiness, enjoyment, and reward as intensely as other people can. This makes you more vulnerable to becoming depressed. You are out of touch with what you want, need or enjoy. Why don’t you know these things well enough? Because the way to know what you want is by feelings like desire, craving or longing; the way to know what you need is by feeling deprived or needy; and the way to know what you enjoy is by feeling rewarded, pleased, happy or pleased. When you are cut off from your own feelings, you are not able to know these things as well as you should. This makes it difficult to seek what you should be seeking, or make yourself happy. This makes you more likely to become depressed. Even when you know what you would enjoy, it’s hard for you to prioritize your own needs. Since few folks are 100% removed from all of their feelings, there are probably times when you do know what you want, need or will enjoy. But when you grew up with Emotional Neglect, you learned to keep your wants and needs to yourself. So even if you do know what you would like, something deep inside stops you from requesting it. Other people’s wants and needs always seem more important or more legitimate, and you allow your own to fall between the cracks. Unlikely to prioritize your own wishes, you are unwittingly making yourself more likely to become depressed. You may have made some life decisions that aren’t right for you. A funny thing happens when you are not connected with your feelings: you don’t get to make major life decisions based on your feelings. And, after all, our feelings are our most effective guides to our true selves. This is why so many people who grew up with Childhood Emotional Neglect end up in jobs, marriages, and locations that are not quite right for them. Going through the motions, living the life that chose you instead of the life you chose to live, you may find yourself feeling off-kilter, unfulfilled, and somewhat at-sea in your adult life. This lowers your defenses to depression. Not all people who grew up with Emotional Neglect end up with depression, but many do. The reality is that the feelings that we allow ourselves to feel, even if they hurt, inform us. They tell us what to do to fix things, and how to make ourselves happy. But feelings that are walled off are able to do none of those things for us. Instead, they hang over our lives like a dark cloud. But that dark cloud need not be a part of your life forever. You can access those old feelings and process them now, and they will lose their power over you. You can learn a new way to allow yourself to feel and use your current feelings too. And both of these new skills will not only make you less depressed, but they will also make you less likely to become depressed in the future. Start paying attention to your feelings as your friends and helpers. Start expressing your wants, needs, and wishes. You can learn much more about how to heal your Childhood Emotional Neglect throughout this site. 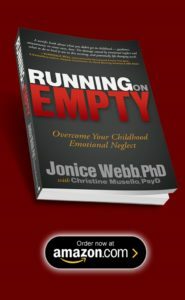 To go even deeper into the healing process, see the book, Running On Empty: Overcome Your Childhood Emotional Neglect. 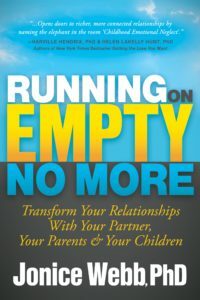 To learn how Childhood Emotional Neglect affects your relationships, and how to heal those effects, see the book, Running On Empty No More: Transform Your Relationships With Your Partner, Your Parent & Your Children. My mother was a narc and anti men to boot! When she found out she was pregnant she told my dad if it was a boy she would hate it and she did. She emotionally abused me all through my childhood and constantly put me down. My dad was an enabler who supported her behavior for his peace. But sometimes he did help me. So any time I got excited about something I was told to calm down. Any time I was upset I was belittled. Anything I wanted my mother tried to stymie. For my 14th birthday I wanted some gear so i could processes my own film and when my mother asked what I wanted I told her. She said she didn’t think so as it was just a passing fad!! 45 years later photography is still my main interest. Any goals I voiced were put down and I also learnt not to voice any preference when asked because it would be wrong. I was the scapegoat and everything was my fault. My mother never nurtured me at all and the only time she touched me was to discipline me. Consequently I learned to never have an opinion, never show emotion if possible and never see any goals. I never get really excited about anything and if I do show any excitement it feels false. I am very pessimistic and live behind a glass wall. I prefer to be on my own as it’s safer easier. I am incredibly independent and never ask for help at all. I have a touch aversion in that if someone touches me without me being prepared I freeze. If someone asks to give me a hug I refuse. My dad pushed me into being a professional photographer even though I doubted my ability and I found it very hard trying to sell my own work because of self doubt. I couldn’t even enjoy getting a good sale as my inner critic would cut me down. A therapist once asked me what my goals and dreams were and I had to ask what she meant as I had none really and learnt not to have any. Silly things are incredibly difficult. I was staying with relatives as a teenager and my aunt asked if I wanted mashed or whole potatoes for dinner. I couldn’t make a decision. In my experience no matter what wanted it would be wrong. My dad in his later years got dementia. As I was the only one in the country I hard to deal with things when they came up. His personality changed and he started blaming me. He was in hospital after breaking his neck and I phoned him every day. I talked to the nurses Bertie before speaking to him. If I told him something he would tell me I had no right to know that and that they hadn’t told him which thru had but his short term memory was gone. It was like reliving my childhood! It was like him telling me to do a cartwheel and being told off if I did it clockwise, but also if I did it anti clockwise. I have struggled with depression most of my life and am currently waiting to see yet another counsellor (UK NHS) This time I have a better understanding of how I was treated as a child emotionally, and its effect on me as an adult. I am so grateful to have found your blog. Recognising that I have carried CEN through most of my life has in some ways opened Pandora’s box as issues I have suppressed for years are finally breaking through the walls I have put up. It’s hard at times to process some of these issues but despite being very depressed I now know that it’s ok to say how I feel, to give voice to events that hurt me at the time and have continued to hurt me for many years and most importantly to accept positive love and friendship. Finally at the age of 56 I am starting to make friends, something that I have avoided as I did not feel worthy of friends, that is thanks to your guidance and my better understanding of the CEN I have experienced through not only my childhood but also into adulthood. My mother still tries to treat me in the same way but at least now i have some understanding of what she is doing to me emotionally. After only reading a couple of your articles, I found myself accepting fully and be courageous in the face of conflict. I also found myself telling someone that my parents were nice parents, the first time I ever said that in my 27 years of life. I became all the more accepting and understanding, even appreciative, of responsibilities my parents gave me. You make me feel satisfied in the care of my parents, and in all earnestness, I was headed towards being a permissive parent until I read your articles. Thanks for asking that question, Dave K. Well articulated and something I sure struggle with. This may be an off the wall question about CEN and depression, but I will ask it anyhow. I have been chronically depression just about my whole life. I grew up with a mother who was physically absent most of my early childhood. She also passed away when I was eight years old. I am now 52 and have been working very hard on this issue with my therapist. Here is where the weird stuff starts happening. Since I have been working with this therapist I have had removed my uterus, ovaries, gallbladder and I am scheduled on Oct 31st to have my appendix removed. All these organs have gone bad within six months of each other. Here lies the question, is it possible the negative energy I have been dealing with and letting go has an effect on my organ? I don’t believe in coincidences. I would like your input on this situation. Dear Laura, I am sorry for all of the difficult things you have endured, both emotionally and physically. I wish I had an answer for you. Research does show that mind and body are far more connected than ever thought before, but that is the most I can say about your question. I hope you’ll work on your CEN and that your therapist will help you walk the path of recovery. All my best wishes to you. Thank you for your years of research and practice with CEN. There is a big part of me that somehow feels unwilling to consider it…I feel guilty that somehow I’m giving my bag of “stuff” to someone I love, to hold. I understand that if our parents experienced CEN when they grew up, how would they know to do anything different without even understanding their own predicament. Looking back, through this lense, I can see that there were many emotions suppressed. I am grateful to you for sharing this information. There are so many things that make sense now, and that help explain some of the difficulties. I was married for several years to a man who grew up with CEN, but who seemed to lash out rather than suppress. So, it never occurred to me that emotional suppression could be the result of CEN, when all I experienced in my marriage was the opposite! I wonder too, if you didn’t grow up with CEN, if being married to someone who experienced CEN could then alter your own emotions…creating a now adult version of CEN in their spouse. Stop reading my mail, Jonice! But in all seriousness, this article profoundly resonated with me. In the past year I’ve started self-harming compulsively, was diagnosed with depression, ended up hospitalized in a psych unit, and then had the additional diagnosis of complicated grief disorder for something that happened 6 years ago that I stuffed away as best I could … until it reared its ugly head again. Apparently emotions are real, and we need to listen to what they’re telling us. I wish I’d grown up with this understanding, but I’m glad I’m learning about it now. This is perfectly on point and is my growing up and adulthood to date. Your first seminar (at Kripalu) was a balm to my broken heart and depressed spirit. I haven’t done much since. This article/summary/truth may be what I need to start doing the work again. It’s OK if you’ve taken a break from working on your CEN Cheryl. What matters is that you get back to it. Persistence is the biggest key to recovery. Your article is timely. I’m in an extremely negative situation, the quality of my life is rock bottom and I am depressed more and more each day, knowing I’m in need of processing my empty childhood. Yesterday I pondered how I was like an empty shell walking around, like a dead person. My depression encompasses many issues in my life presently. #1, I don’t feel empowered to change, but I am in the process of finding a new counselor. #2, I realize my life losses, this covers every basic need and conventional way of living from college, marriage, etc. Having never experienced basic successes. When I look at this reality, depression is inevitable. I have been frozen for many years. I think my body is trying to thaw, as I can cry at the drop of a hat. I use to be hopeful, but my reality is overwhelming, alot of hard work at a snail’s pace. My prayer is to not become bitter and anger rules my spirit. Thanks for your article. Thanks for your detail, and being thorough. This year i lost both my brother and sister…soo hard. In having to bury them before my parents has been so unnatural of the order of things. Not 1 time has either parents asked how im doing, etc, etc. Each parent i know are griefing, but its so hard to never see parents on the outside not show any emotions. I know i could be off base, but im 56 yr female and tell this day my feelings seem to not matter. Is this running on empty behavior? I’m so sorry you’ve had these losses Teresa. Yes, treating your emotions as if they don’t matter is “normal” for CEN folks. You are simply continuing what you were taught as a child. But you can change that. Sending you all my best wishes. This explanation linking CEN and depression is 100% accurate in my experience. I never learned to cope emotionally in difficult situations but reacted in ways that were extremely damaging in every aspect of my life. The persecution I experienced has forced me to live without ever knowing my feelings because when I did as a child, I would hide or freeze to escape punishment. Sometimes I got away and finally I ran away from home and my beloved mother, in a state of fear, at a young age when I could have flourished and been happy to be alive. My first depression came when I was 14 . The one thing that bothers me is that, if you as a child, never got any adult help in interpreting your feelings, and you thus lack maturity, but now you start bringing those feelings up, to be guided by them, won’t you do a lot of stupid, embarrassing things, and come to regret it? How can you be sure you should be guided by some particular feeling? Dear Dave, yes this is an issue! That’s why one of the steps of CEN recovery is all about learning the emotion skills. Once you have more emotion, it’s vital to learn how to manage them and use them.